The Englishman took on Simon Whitlock, who had sat at the top of the table prior to the encounter having also won his opening three matches. Whitlock started the brighter of the pair breaking in the opening leg of the match to punish Smith for missing two darts for an early hold. The 27-year-old from St Helens then put together a string of four consecutive legs to take control of the tie and move three clear of his opponent. Whitlock was never able to recover and Smith ran out a 7-3 winner, hitting five 180s on a special night in Germany. "As soon as I got on stage the hairs on my arms stood up because of the crowd, that was amazing out there," said Smith. "I'm not playing well and I'm winning. To have four wins out of four is great and when I start playing well it will be even better!" The Austrian ace averaged 106.53 and hit 60% of his attempts at doubles in a match he was in control of throughout. The 45-year-old raced in to a 5-1 lead and Price, who has struggled to find his form so far in this year's event, couldn't cope with his Premier League opponent. "The crowd is amazing and I'm so happy to be here with my friends and family," said the Austrian. "I was nervous for the first week, and nervous for the second but I am playing well and starting to feel better. "It is good to win and amazing to be in Germany. It was a perfect night." The world number one came out of the blocks in inspired form and was averaging 115 in the early stages, before five missed doubles allowed Gurney to hit back with his first leg. The two-time World Champion was in no mood to hand his opponent any more chances though and bulldozed his way in to a 6-1 lead before eventually running out as a 7-2 winner with an average of 104. "I think I played okay and I did the right things at the right moments to get the two points," said Van Gerwen. "I didn't make a lot of mistakes and my confidence is good at the moment. "This was amazing tonight and darts is getting bigger and better all over the world. I love what I do and that's very important, and this was a special night." Cross, who had stared the Premier League with two defeats, picked up his first points last week in Newcastle when he defeated Peter Wright and doubled his tally in Berlin against the five-time World Champion. 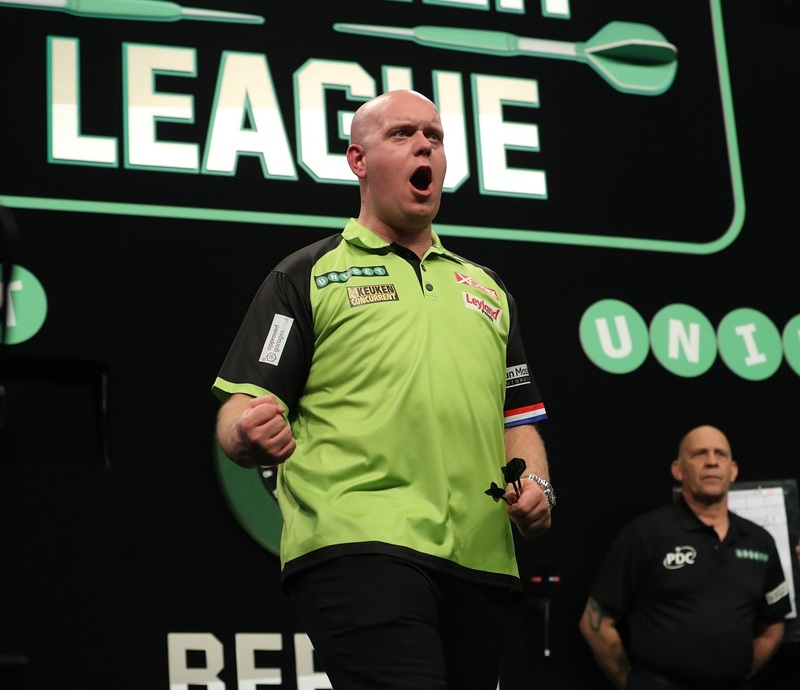 The pair were locked at 3-3 going in to the seventh leg, with the Dutchman taking out 112 in the sixth to level the score before Cross went on to take control of the match. An out of sorts Van Barneveld missed seven of his ten attempts at a double and made a mid-game change of darts, and was punished as the World Champion won the final four legs without reply, sealing the win with a 128 checkout. "It was absolutely phenomenal tonight and it's great to be a part of something like this, and I'm happy to get the win," said Cross. "Raymond didn't play his best and he wasn't himself tonight, but the doubles went well for me and I'm happy with that. I'm feeling more comfortable and I'm getting there. "Every week I'll keep getting better and I feel like me again. I'm getting more clinical and though I wouldn't say I'm 100 percent I'm trying to stay focused." Anderson started the more clinical of the pair, moving in to a 2-0 lead, including a 150 checkout to take the initiative in the match despite Wright landing three 180s in the first two legs. Wright then took the following three legs to take the lead for the first time before Anderson levelled the tie. 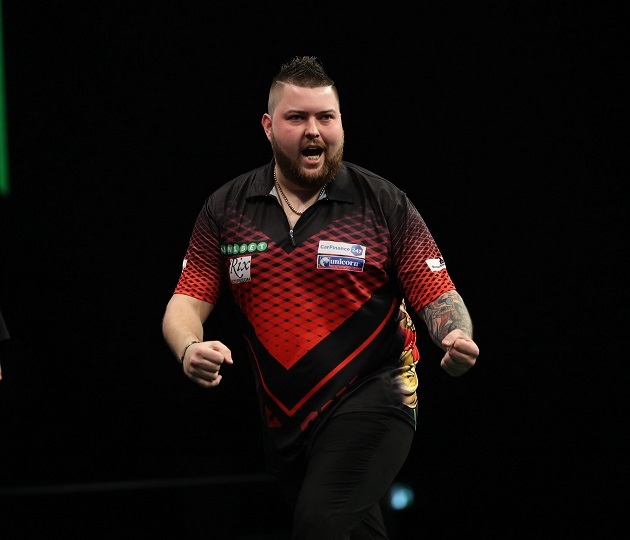 A hold of throw, followed by a 12-dart break gave Wright a 5-3 lead before he sealed a minimum of a point by winning his sixth leg with a 120 finish. 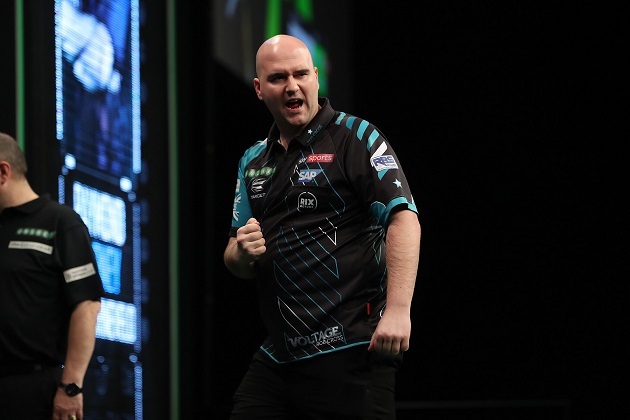 Legs of 12 and 11 darts from Anderson saw him force a deciding leg, before he capitalised on a missed bullseye from his opponent to hit the middle double and secure a point. 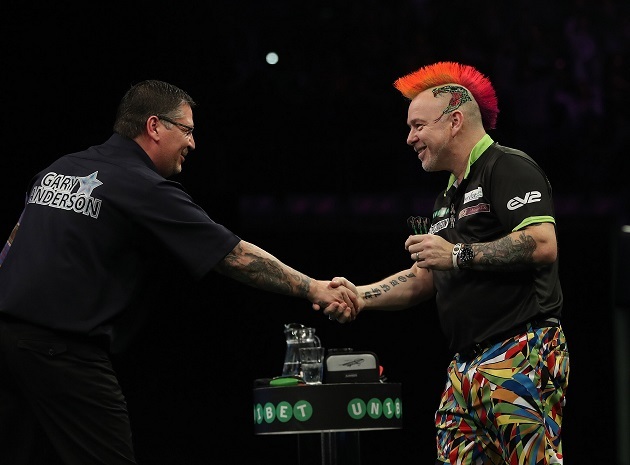 Both players averaged over 105 in a high-quality encounter to end a sensational first trip to Berlin for the Unibet Premier League, and Wright spoke of his pride of the growth of darts in Germany after the match. "It's amazing to be part of how big darts has become in Germany, I just want to say thank you to all the fans," said the Scot, who is now on four points. "To be out there in front of such amazing fans is a privilege and with more events like this we may see some of the German players like Martin Schindler join the Premier League one day."